The following procedure shows you how to log in to UW Zoom on the web. Trying to log into a UW Zoom account with a Shared NetID? Two kinds of UW Zoom accounts are available: Standard and HIPAA. People who work in healthcare in any capacity at the UW will likely need the HIPAA-compliant account. Otherwise, the UW Zoom Standard account (which does provide FERPA protection) is sufficient for your needs. Learn more about HIPAA-compliant Zoom accounts. You can also download the Zoom app to your computer (or a meeting room computer) and log in directly to the app. Quit your browser and Zoom software to log out of your UW NetID and Zoom accounts. How do I log out of UW NetID with the browser I’m using? Open a new browser session, making sure that you are not logged into any sites with your UW NetID. To log in to your Zoom account, go to washington.zoom.us. You will be taken to the Zoom log in page. To log in to a UW Zoom Basic account, on the left, click Basic and Pro Account Login. To log in to a HIPAA-compliant account, on the right, click HIPAA Account Login. 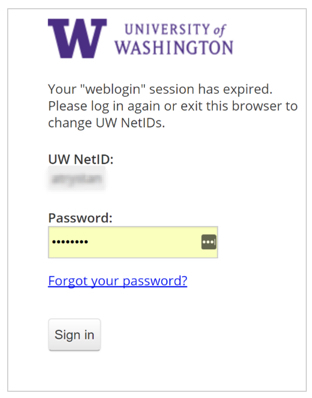 You will be directed to the UW NetID login screen. Sign in is now complete.